Until March 2, 2014 Microsoft has some sweet deals at their retail stores. You can get a free Nokia Lumia 1020 or 1520 or $250 credit when you trade in a working smartphone or tablet. Sounds great if you live within a reasonable driving distance of Microsoft's 60 stores in North America. This seems like an odd offer in a world of online sales, from a computer company with an online store themselves. Both of these deals ignore the fact that people like to shop online. Weird. The limitations on both offers tell me Microsoft has bush league retail marketing plans and does not have any idea how to become more than a 3rd place vendor of smartphones and tablets. By comparison, you can buy Apple and Samsung devices almost everywhere. That's how you roll today to win. Yes that's an almost free phone. Just sign up for a 2 year contract (new, renewal or upgrade) with a carrier, probably AT&T. The free phone only applies in the US retail Microsoft Stores. The trade-in is for iPhone 4, iPhone 4s or Galaxy S2 and the retail value of the "free" phone is about $99. It varies because the carriers have their own pricing for contract phones. I could go for either of these phones. 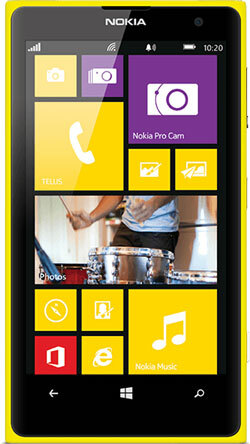 The Lumia 1020 has the world's biggest 41 MP camera. The Lumia 1520 is the new 6&Prime screen and a 20 MP camera with the best sound recording in smartphones. The niggles are the offer is US retail store only and the 2 year contract requirement. It's cheaper to buy your phone outright and shop for the best data package. The trade in credit applies to old smartphones or tablets that are in good working order, no cracked screens and have the power supply. The credit only applies to in-store purchases in the United States and Canada until March 2, 2014. The amount of the credit is determined when you go to the store, which seems rather dodgy. There should be a fixed scale for trade-in values to help you see what your phone or tablet is worth. Apple's trade-up places usually have a way to check it and there are firms who do this as a business. Microsoft are pitching the idea of buying a new Surface 2 starting at $449, with 32GB storage, Windows RT 8.1 and comes preinstalled with Microsoft Office 2013 RT, so you get Outlook, Word, Excel, PowerPoint, OneNote, and 200 GB of OneDrive (SkyDrive) cloud storage for 2 years. With the touch cover that comes to $618. If you got the full $250 credit, the Surface 2 will cost $368 which isn't bad for a 10.6&Prime Windows 8.1 tablet. I had one and they are very nice. Downside, It's RT and won't run regular Windows programs and Microsoft more or less said Windows RT will go away next year. If it were me and money wasn't the only object, I would opt for the full Windows Surface Pro 2, which better equipped with 64 GB storage and full Windows 8.1 for $899. 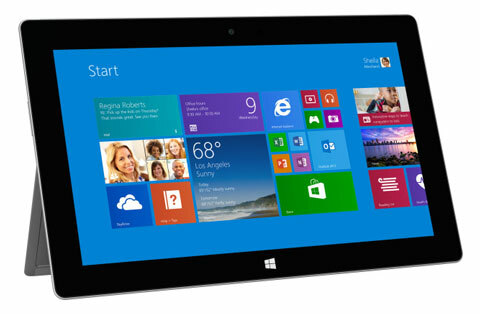 At least your new tablet won't be a cast off next year and Surface Pro 2 can substitute for a laptop or ultrabook.